!! Sources are available to modify on Github !! I created this plugin because I was not feeling very comfortable in explaining to my clients how to add images to their blog post. Via the Composer or via the online editing interface, adding images from their computer or file manager were a succession of clicks of approbation, choice.. I wanted to add an image from the computer is done in ONLY ONE click and edit the title and description of the file was also done with a click and be intuitive. I am arriving at this editing mode that respects the philosophy of concrete5. 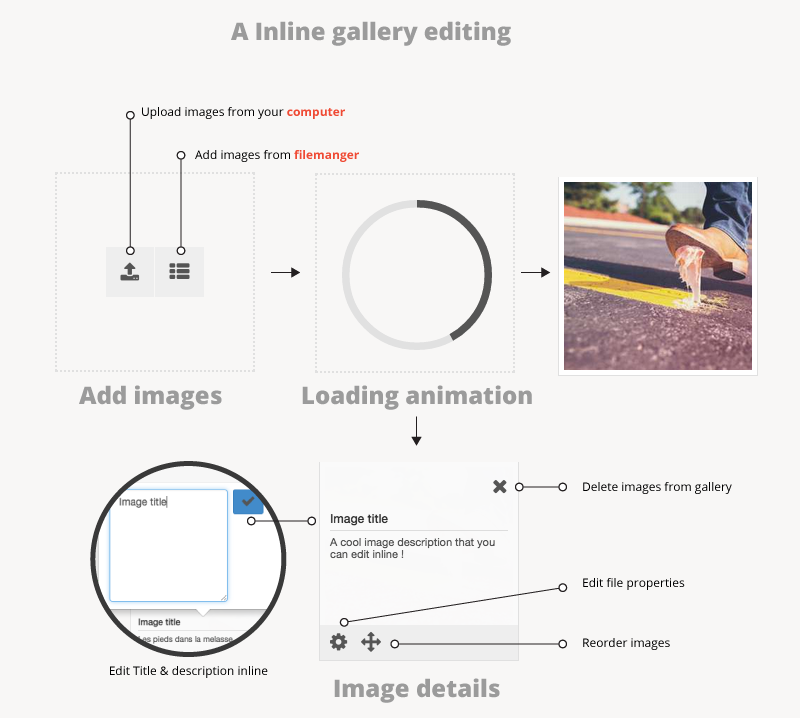 7 and intensifying the ease of adding a picture gallery. So concretely, once the add-on added to the page (or the Composer interface) you can directly add images from your computer (they will be added to the file manager in the background) or from the file manager. once selected file / uploaded, you can immediately edit its attribute title and description. You can also Declared a fullest and all the images of it will be added to the gallery, you can then edit title and description. The plugin provides you the option to search in the current layout so you can find items very quickly. Lazy Load helps to display gallery in no times. Each grey image is replaced by a retina thumbnail once present in the browser viewing area. A New attribute "Images Tags" is added to the packages. You can specify one or more tags for each image and the user will can filter target the gallery. Through an attribute you can set a special number of columns on certain image (like in the demo) to add more attention on some images. This plugin offer to you two professional lightboxes: The ultra famous "FancyBox" (used by this site) and The "Intense Lightbox", a very nice full screen lightbox. Full width, the grid will adapt to the 100% of its container. Deactivate and Activate Features through edit. Support Response: Replies to tickets every few days.